Almost all companies and businesses today make use of information technology as part of their business processes, regardless if the business is solely about information technology-related stuff or not. This is when an information technology strategic plan becomes necessary. 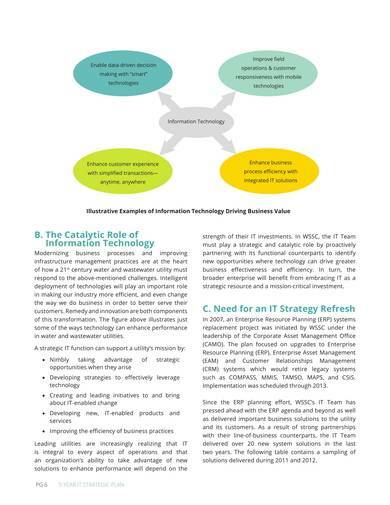 An information technology strategic plan is a document that contains all of the details required to help a business use information technology in achieving and managing a business. The plan is a comprehensive one that, includes principles, objectives, and tactics that will guide the business in the use of information technology. Here we will be learning about the different IT strategy plans, what their features are, how they are used, and many more. Sample strategic plan templates are provided for your reference. Well-written steps are essential in creating a plan, especially in an IT strategic plan. 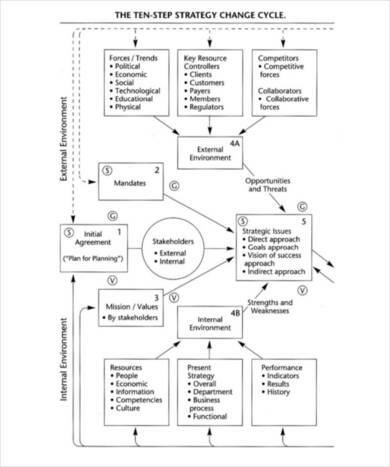 This plan template provides a ten-step strategy change cycle flow chart and other important details required in the plan, such as a background of the entire plan, a strategic planning model, other flowcharts and related figures, detailed steps on how to use the template, etc. An IT strategy plan can be a short-term or a long-term plan depending on the institution or organization who will be using it. Long-term strategic plans can last up to five years or more. If a long-term strategic plan is what you need, then this 5-year IT strategic plan sample template will be of great help to you. The template has nice layout and colored pages to ensure that you won’t get bored going over it. The basic parts of a strategic plan are also provided together with other essential information. Colleges need a strategic plan too. 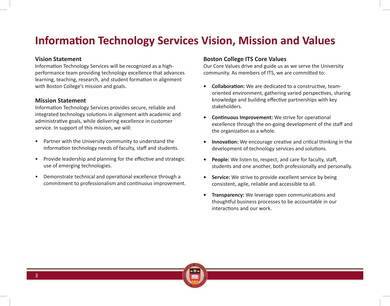 This college IT strategic plan sample template is specifically created and used by the Boston College IT department. It details the department’s operations, infrastructure, vision, mission, goals, etc. It is a comprehensive strategic plan that will help you learn more about how the department works and does things. The template includes a title page, table of contents, a foreword page, an introduction page, research, customer service, acknowledgments, etc. Want to go basic? 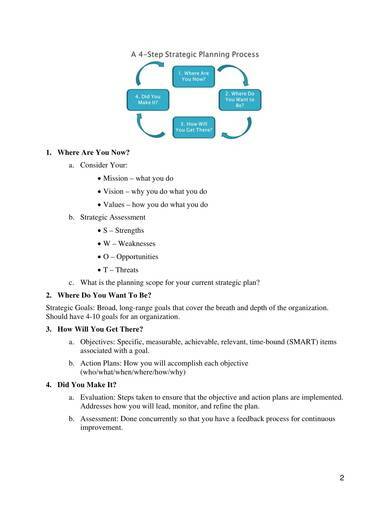 Get as simple as you can with your strategic plan using this basic IT strategic plan template. Although this plan is basic, you can still create a detailed IT strategic plan with it. The first page of the template starts with a strategic planning terminology table. The succeeding pages provide instructions and guide questions on what should be written in each section of the strategic plan. You will also be required to create a mission statement, a SWOT analysis, strategic goals, action plans, etc. 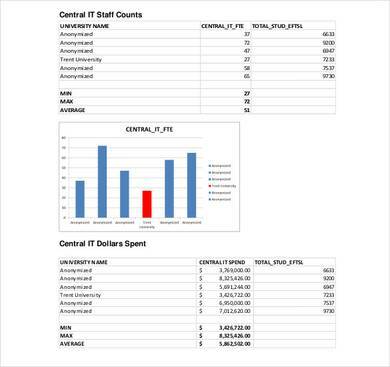 The easiest way to create a IT strategic plan is to create a one-page IT strategic plan and the sample template above will surely be the best tool you will need. 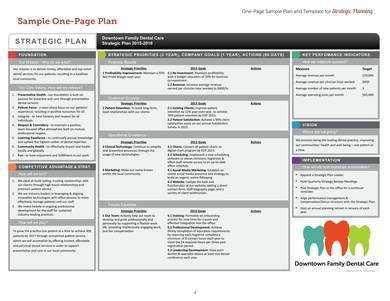 As its name implies, you can create a single page strategic plan with this sample template. Definitions and instructions on how to use and create the plan are provided in a separate page to ensure that the user will be able to effectively use it. This sample template is available in Word which means that it can be easily edited by whoever wants to use it. The template has a neat and professional layout that is mostly used in different companies and organizations. What are included in this sample template? This sample template includes an overview, mission, competitive advantages, core values and guiding, vision statement, etc. 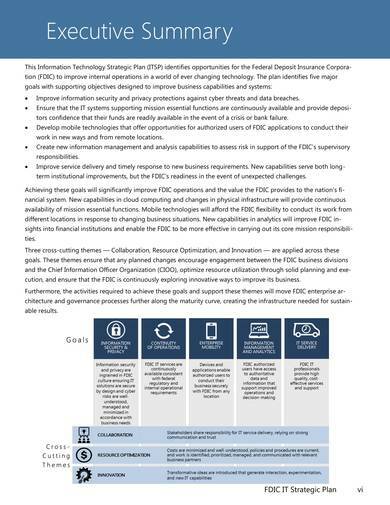 Use this insurance corporation information technology strategic plan as reference to help you and guide you with creating an IT strategic plan for your insurance corporation. The detailed sample will show you how the entire plan is done starting from the executive summary down to the different appendices required in the plan. When you need a strategic plan template that provides detailed instructions, then you can rely on this information technology services strategic plan template. The plan consists of table rows and columns where the different sections are of the strategic plan are written. This is done so that the details do not mix up and to avoid confusion for the users. The table format allows the users to easily find the information or instruction that they need. And if it’s with the content you need help with, every section provides detailed step-by-step instructions on what you should be writing. 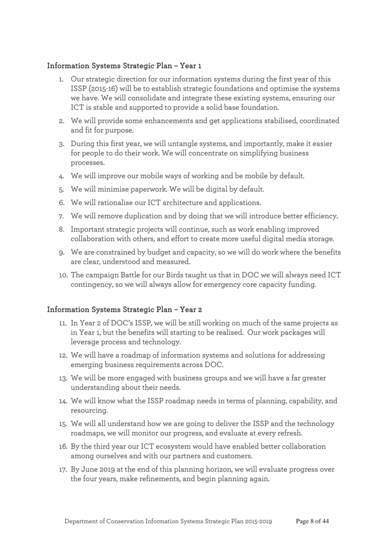 The Department of Conservation or DOC specifically uses this information systems strategic plan sample template. There are several photos and illustrations in the sample template that shows information and other essential data related to the plan. And because the plan is lengthy, a page dedicated for the table of contents is provided. You will also be able to easily distinguish the different sections of the plan as they are written in bold and others are numbered. 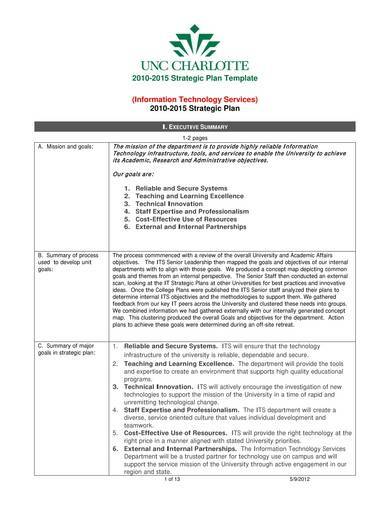 This is what a university IT strategic plan looks like. 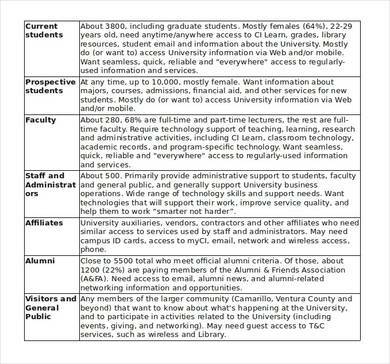 The sample above is just one of the many sample templates being used by different universities. This is very useful if you need a reference in making one or if you need new ideas foe your own IT strategic plan. 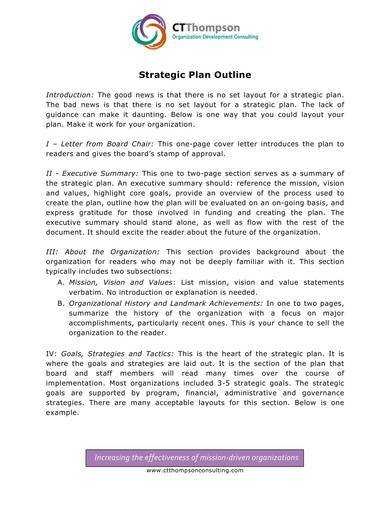 The simple IT strategic plan outline template consists only of two pages and is definitely easy to use. It provides instructions on how you can go about writing the different sections of the strategic plan, which includes the introduction; the letter from board chair; the executive summary; about the organization; goals, strategies and tactics; financial projections; and the appendices. Need help with your IT strategic plan? Then look no further as the samples we have presented above will surely help you. But if you need more, you can surely check out different strategic plan samples and templates, like strategic sales plan templates and strategic marketing plan templates.